Jacobsite: Mineral information, data and localities. Named in 1869 by Augustin Alexis Damour for the type locality of Jakobsberg, Sweden. Jacobsite-Magnetite Series. Often in octahedral crystals. Jacobsite-Q is a polymorph of jacobsite. Visit gemdat.org for gemological information about Jacobsite. Octahedral. Rarely found as crystals. Massive, granular. Damour, A.A. (1869) Notice sur la jakobsite, nouvelle espèce minérale. Comptes Rendus Hebdomadaires des Séances de l’Académie des Sciences: 69: 168-172. Calcite 22 photos of Jacobsite associated with Calcite on mindat.org. Zincite 9 photos of Jacobsite associated with Zincite on mindat.org. Manganosite 8 photos of Jacobsite associated with Manganosite on mindat.org. Andradite 6 photos of Jacobsite associated with Andradite on mindat.org. Tephroite 5 photos of Jacobsite associated with Tephroite on mindat.org. Wiserite 4 photos of Jacobsite associated with Wiserite on mindat.org. Galaxite 4 photos of Jacobsite associated with Galaxite on mindat.org. Plumboferrite 3 photos of Jacobsite associated with Plumboferrite on mindat.org. Hausmannite 2 photos of Jacobsite associated with Hausmannite on mindat.org. Manganoan Vesuvianite 2 photos of Jacobsite associated with Manganoan Vesuvianite on mindat.org. Nordenskiõld, A.E. (1877) Nya mineralier från Långban. Geologiska Föreningens i Stockholm Förhandlingar: 3: 376-384. Flink, Gustav (1886) Ak. Stockholm Bh. : 12(2): 2, 20. Fermor (1909) Geological Survey of India, Rcords: 37: 199. Johansson, K. (1928) Mineralogische Mitteilungen. Zeitschrift für Kristallographie: 68: 87-118. Orcel and Pavlovitch (1932) Bull. soc. min. : 54: 108. Fleischer, M. (1944) New mineral names. American Mineralogist: 29: 73-74. Wickman, F.E. (1947) A redetermination of the space-group of jacobsite. Geol. Foren. Forhandl. Stockholm: 69: 363–365. Butler, S.R., Buessem, W.R. (1962) Variations of the lattice constant and line width of x-ray reflections from manganese ferrite. Journal of Physics and Chemistry of Solids): 23: 1661-1669. DeWaal, S.A. (1969) Nickel minerals from Barberton, South Africa: I. Ferroan trevorite. American Mineralogist: 54: 1204-1208. 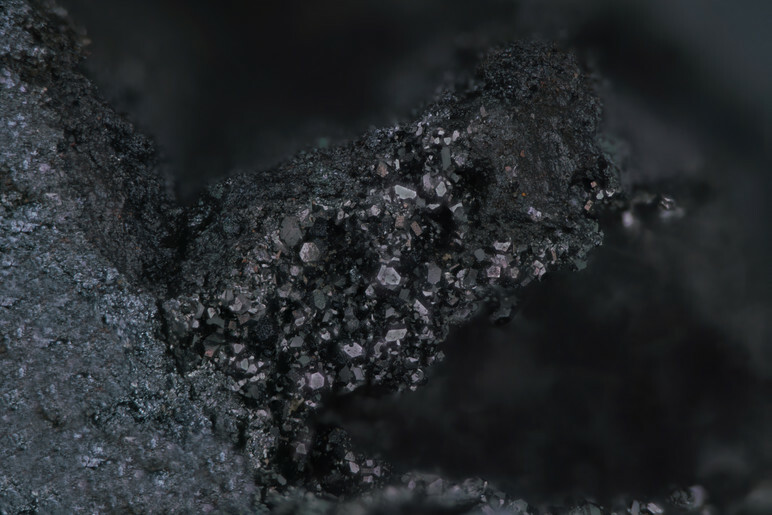 Beard, J.S., Tracy, R.J. (2002) Spinels and other oxides in Mn-rich rocks from the Hutter Mine, Pittsylvania County, Virginia, U.S.A.: implications for miscibility and solvus relations among jacobsite, galaxite, and magnetite. American Mineralogist: 87: 690-698. Gottesmann, W., Gottesmann, B., Seifert, W., Unger, H. (2015) The jacobsite-magnetite series at the Tumurtijn-ovoo Fe-Mn-Zn skarn deposit, Mongolia. Neues Jahrbuch für Mineralogie - Abhandlungen: Journal of Mineralogy and Geochemistry: 192: 289-306. The following Jacobsite specimens are currently listed for sale on minfind.com. Stillwell, F.L., Edwards, A.B. (1950) Jacobsite form the Tamworth district of New South Wales. 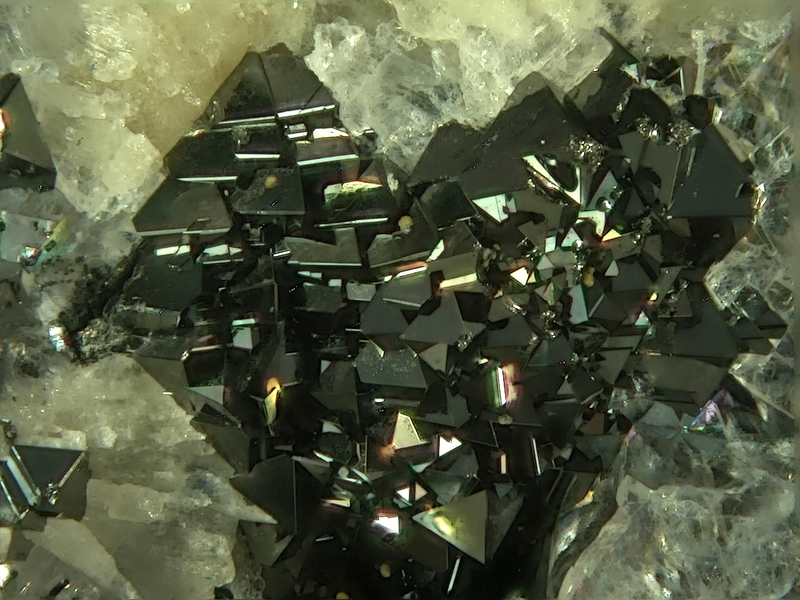 Mineralogical Magazine, 29:212, 538-541. Collection of M.Willoughby. Confirmation via. South Australian Museum. Pilkington, E. S., Segnit, E. R., Watts, J. and Francis, G. (1979): Kleemanite, a new zinc aluminium phosphate. Mineralogical Magazine 43, 93-95. Meixner, H. (1935). Eine neue Manganparagenese vom Schwarzsee („Kolsberger Alpe") bei Tweng in den Radstädter Tauern. N. Jb. f. Mineral., Beil. Bd. 69, A, 500-514. Fan Delian, Li Jiaju, Ye Jie, Hariya, Y., and Miura, H. (1992): Some new data on manganese silicate-manganese oxide ores from ferro-manganese ore deposit Wafangzi, PRC (abstract). 29th international geological congress (Kyoto, 24 August - 3 September 1992). Chauris, L. (2014): Minéraux de Bretagne, Les Editions du Piat, 203. Dasgupta, S., Bhattacharya, P. K., Banerjee, H., Fukuoka, M., Majumdar, N., & Suprya, R. (1987). Calderite-rich garnets from metamorphosed manganese silicate rocks of the Sausar Group, India, and their derivation. Mineral Mag, 51, 577-583. Baldanza, B. (1953) Ricerche sulle mineralizzazioni dei Peloritani. II. La mineralizzazione ferro manganesifera della contrada Palazzo di Bozzo (Nizza, Sicilia). Periodico di Mineralogia, 22, 1-18; Rendiconti della Società Mineralogica Italiana, 9, 240-241 (abstract). Dr. Kameki Kinoshita collection (curated at Geological Survey of Japan); 加藤昭, & 松原聰. (1980). 本邦産マンガン硼酸塩鉱物. 鉱物学雜誌, 14(Special3), 86-97. Akira Kato (2011) Explanations of distributed specimens at the Ordinary Meeting of Mumeikai Group, No. 34 (January, 20011). Kato, A. (2010) Mumeikai Group meeting, No. 30. Hiroaki Tano specimens; 加藤昭, & 松原聰. (1980). 本邦産マンガン硼酸塩鉱物. 鉱物学雜誌, 14(Special3), 86-97. Akira Kato (undated manuscript): Country rock and Minerals of the Kaso mine, Kanuma City, Tochigi Prefecture. (in japanese); 加藤昭, & 松原聰. (1980). 本邦産マンガン硼酸塩鉱物. 鉱物学雜誌, 14(Special3), 86-97. N. Aikawa (1987) Journal of Geosciences, Osaka City University, 30, 1-13.; 加藤昭, & 松原聰. (1980). 本邦産マンガン硼酸塩鉱物. 鉱物学雜誌, 14(Special3), 86-97. Banno, Y., & Yamada, S. (2012). Sector-zoned aegirine in Sanbagawa quartz schist from the western Kii Peninsula, central Japan. Journal of Mineralogical and Petrological Sciences, 107(4), 167-172. Kayupova, M. M. (1963): Mineralogy of the Dzhumart iron-manganese deposit. Izvestiya Akademii Nauk Kazakhskoi SSR, Seriya Geologicheskaya, 1963 (6), 57-80. Gottesmann, W. et al. (2009): N. Jb. Mineral. 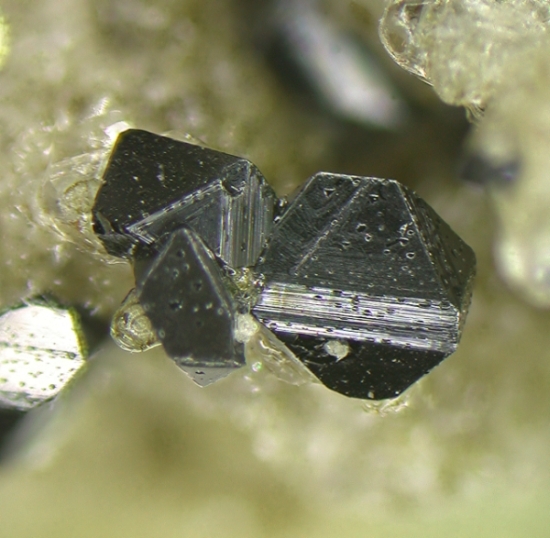 185, 249-280; Gottesmann, W., Gottesmann, B., Seifert, W., Unger, H. (2015): The jacobsite-magnetite series at the Tumurtijn-ovoo Fe-Mn-Zn skarn deposit, Mongolia. Neues Jahrbuch für Mineralogie - Abhandlungen: Journal of Mineralogy and Geochemistry 192, 289-306. Criddle, A. J., Keller, P., Stanley, C. J., Innes, J. (1990): Damaraite, a new lead oxychloride mineral from the Kombat mine, Namibia (South West Africa). Mineralogical Magazine 54, 593-598. Bezing, L. von, Bode, R. & Jahn, S. (2007): Namibia. Minerals and Localities. Edition Schloss Freudenstein, Bode Verlag, Haltern, 368 pp. (in English); Cabral, A. R., Moore, J. M., Mapani, B. S., Koubová, M., & Sattler, C. D. (2011). Geochemical and mineralogical constraints on the genesis of the Otjosondu ferromanganese deposit, Namibia: hydrothermal exhalative versus hydrogenetic (including snowball-earth) origins. South African Journal of Geology, 114(1), 57-76. Ozdín, D., Uher, P. (2010): Jakobsit pri Dobšinskej ľadovej jaskyni-mýtus alebo realita? Minerál, 18, 4, 363-365. Preston, P. C. C. R. (2009). Physical and chemical characterization of the manganese ore bed at the Mamatwan mine, Kalahari manganese field (Doctoral dissertation). ⓘ Nababeep West Mine (Nababeep Near West mine) ? Palache, C., Berman, H., & Frondel, C. (1951), The System of Mineralogy of James Dwight Dana and Edward Salisbury Dana, Yale University 1837-1892, Volume II: 857.; Moore, P. B. (1972). III. On Igelström's Manganese Arsenates and Antimonates from the Sjö Mine, Grythyttan, Örebro County, Sweden. GFF, 94(3), 423-434. Igelström, L. J. (1890): Mineralogiska meddelanden 11. Jakobsit och braunit vid Glakärnsgrufvan, Linde socken, Örebro län. En ny fundort för dessa mineral i Sverige. 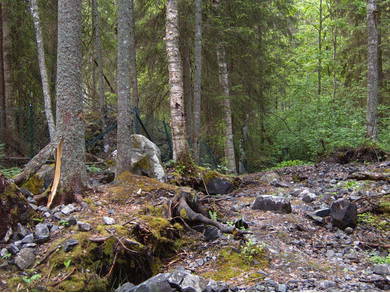 Geologiska Föreningen i Stockholm Förhandlingar (GFF). 12, 137-139. Holtstam, D. (1997): Barian magnetoplumbite from Mangruvan, Orebro, Sweden. GFF 119, 17-19.
ⓘ Nordmark Odal Field (Nordmarksberg) ? Holtstam, D. & Langhof, J. (1995): Metamorphic harkerite from Nordmarks odalfält, Värmland, Sweden. GFF 117, 151-152. Palache, C., Berman, H., & Frondel, C. (1951), The System of Mineralogy of James Dwight Dana and Edward Salisbury Dana, Yale University 1837-1892, Volume II: 778. Brugger, J. (1996): The Fe, Mn, (V, Sb, As, Be, W) deposits of Val Ferrera (Graubünden, Switzerland). Unpublished PhD Thesis, Univ. Basel, 188 p.; Brugger, J., Berlepsch, P. (1997) Johninnesite Na2(Mn)9(Mn,Mg)7(AsO4)2(Si6O17)2(OH)8: a new occurrence in Val Ferrera (Graubünden, Switzerland): Schweiz. Mineral. Petrogr. Mitt., 77, 449-455.
ⓘ Llyn du Bach mine ? Cotterell, T. (2013). A new assemblage of manganese silicates in the Lower Cambrian manganese ore bed, Harlech, Merionethshire, Wales. Journal of the Russell Society 16, 39-51. USGS (2005), Mineral Resources Data System (MRDS): U.S. Geological Survey, Reston, Virginia, loc. file ID #10141537. Shawn Carlson (2010) Mineral News, 26, #11, 1-2 & 9-10. Rocks & Min. :58:111 & 61:328. Frondel, C. & Klein,C., Jr.: Am.Min. :50:1670-1680 (1965); McSween, H.Y., Jr.: Econ. Geology:71:814-817 (1976); Dunn(1995):Pt4:581-582.